A changing climate means less rain and lower water supplies in regions where many people live and much of the planet’s food is produced: the mid-latitudes of the Northern and Southern hemispheres, including the U.S. Southwest, southern Europe and parts of the Middle East, southern Africa, Australia and Chile. 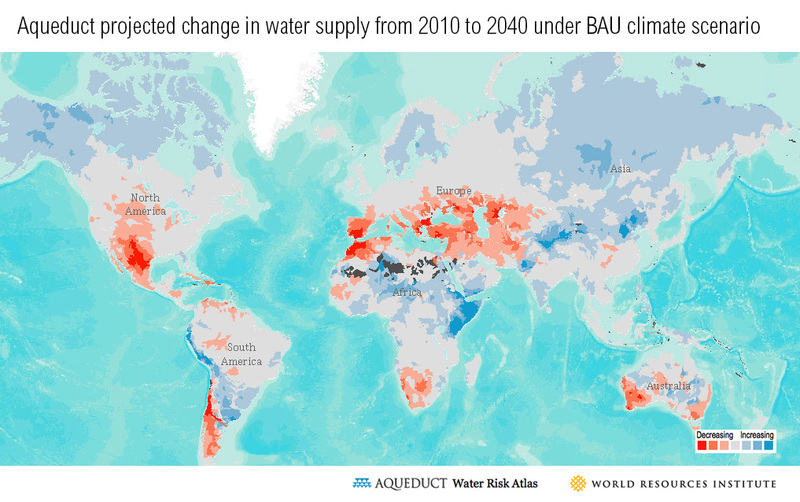 As WRI-Aqueduct’s future scenarios for water supply show, diminished water supplies will be apparent in these areas by 2020 – less than four years away -- and are expected to grow worse by 2030 and 2040. Now a new study in the journal Nature provides some of the first evidence that this widely-predicted phenomenon – the movement of clouds and rainfall from the mid-latitudes towards the North and South poles -- is already taking place. Just like the retreat of glaciers and polar sea ice, now clouds and rain are retreating poleward. This will have huge implications for agricultural production, industrial and energy output, and municipal water provisioning. 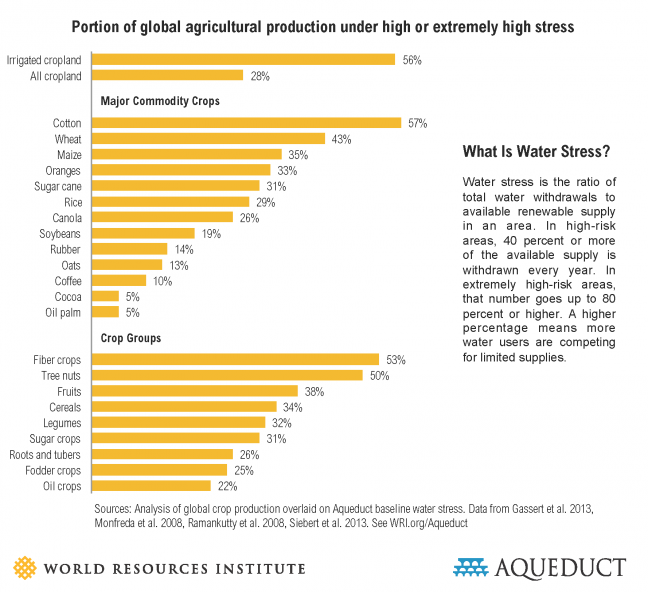 Many irrigated agricultural areas are already facing water stress. The climate-driven shift of clouds and rain – known as Hadley Cell expansion – will put those areas under even greater stress in the future. Rain-fed agriculture, which many poor people depend upon, will also suffer as a result of reduced rainfall in the mid-latitude regions. A recent WRI study finds that sub-Saharan Africa will need to more than triple crop production by 2050 in order to feed its growing population. This hard-to-reach target will become more difficult in places like southern Africa and the western Sahel, where water supply is projected to fall. In addition to worsening water stress and undermining food security, decreasing water supply in the world’s mid-latitudes may also help destabilize nations in these regions, adding to pre-existing political tensions, and helping contribute to armed conflict and migration, as we have seen in places like Syria. What can we do now to prepare for these future climate change threats? First, we need to better understand the nexus of water risk and food security. WRI-Aqueduct, with support from Danida (the Danish development aid agency) and the Skoll Global Threats Fund, is developing an online tool that will help policymakers identify global water risk and food security hot spots. The risks are not always obvious. A country can be relatively water-secure within its own borders, but still be highly dependent on food imports, some of which come from countries whose agricultural production systems face very high levels of water risk. In poor countries, price spikes can put food out of the reach of many citizens. The new WRI Aqueduct tool aims to shed light on these types of threats. Vulnerable countries also need to take steps now to make their food production systems more productive and resilient in the face of climate change. By improving land and water management practices, for example, farmers in Africa have been able to restore soil fertility, capture rainfall before it runs off farm fields, and sustainably increase yields on their farms. A recent WRI study estimates that improving land and water management on just 25 percent of sub-Saharan Africa’s 300 million hectares (more than 740 million acres) of prime cropland would result in an additional 22 million tons of food. Tools and mechanisms can help vulnerable countries cope with drought and famine. The Famine Early Warning Systems Network (FEWS NET), for example, is a leading provider of early warning and analysis on food insecurity. Also important are insurance and subsidy systems that can help support farmers when crops fail. The shifting of cloud and rainfall patterns around the globe are just one more visible sign of the effects of climate change. What we need to begin doing in response is to anticipate the location and magnitude of these effects, and build resilience into the lives and livelihoods of those who will be most vulnerable.